Lot Detail - Grouping of President Garfield Memorial Pieces - “God reigns and thegovernment at Washington still lives”. Grouping of President Garfield Memorial Pieces - “God reigns and thegovernment at Washington still lives”. Admission Card engraving, 9-1/2” x 5-/12”, by U.S. Bureau of Engraving & Printing, with headline "Memorial Service of James Abram Garfield". It was printed for the February 27, 1882 memorial service of United States President James A. Garfield after his death on September 19, 1881. Below the headline is an image of Garfield in an oval of 13 stars and wreath with American flags draped over the oval. To either side of the Garfield image are smaller images of the White House and the Congress. To the left of the image, "President, March 4th 1881, Died September 19th 1881, Age 49 Years." To the right of the image it reads, "Eulogy by Hon. James C. Blaine, House of Representatives, Feby 27th 1882." Below the image are the facsimile signatures of "John Sherman, Chairman Senate Committee" and future President, "William McKinley Jr., Chairman House Committee". 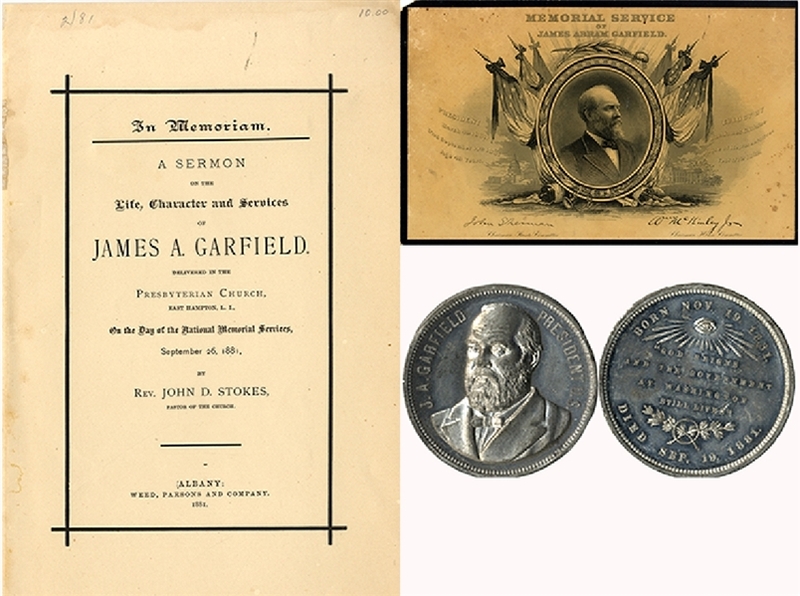 Upper left corner has 1/2” chip, minor foxing in the background, still crisp image, VG .... Booklet, 6-1/2 x 9-3/4 “In Memoriam, James Garfield” 28pp., plus separate cover. “A sermon on the Life and Character and Services of James Garfield ... On the day of National memorial Services, September 26, 1881...” Garfield was taken to Cleveland, Ohio, for burial on September 26, 1881. VG. ... plus, Mourning Coin, 1-1/2” diameter with Garfield bust surrounded by words “J.A. Garfield, President”. The obverse has Birth/Death dates and words “God reigns and thegovernment at Washington still lives”. This statement was spoken at the conclusion of a brief speech made by Gen. Garfield at a mass meeting in front of the Merchants’ Exchange in New York City, April 15, 1865, the day of President Lincoln’s death.